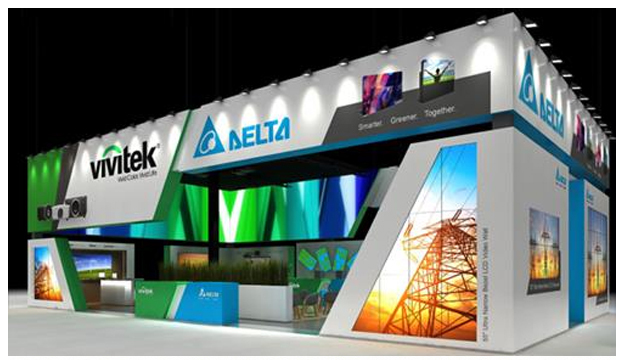 At ISE 2018, Vivitek, a leading brand of visual display products, and Delta Display Solutions, a division of Delta Electronics, will showcase new and existing customers how to Achieve More Together. The combined brands will be demonstrating a full selection of visual solutions ranging from standard and large venue projectors, to wireless collaboration and digital signage solutions. Its wide array of advanced display and presentation solutions are engineered for environments ranging from meeting and collaboration rooms, to larger venues, control rooms, and even entertainment facilities. The Vivitek and Delta Display Solutions stand at Hall 5 R60 at ISE 2018 is set to be more than double the size of last year’s, further amplifying the Achieve More Together sentiment. ISE 2018 will play host to the first public unveiling of a new product in the Delta Displays FE Series with the 1.26mm Fine Pitch Indoor LED Wall Solution. The fine pixel detail of this new product delivers superb image quality and uniformity. Offering a wide variety of pitch sizes from 1.26mm to 2.5mm, the FE series is designed to suit all indoor LED project requirements. Rugged and robust, the LED wall solutions are designed to excel in high ambient light environments, capturing audiences’ attention and providing an unforgettable viewing experience. Delta Displays offers pre-set configurations in different sizes based on the pixel size in Full-HD and UHD resolution, complete with frame and controller to simplify the selection for the end customer and help them achieve the result they aim for in their display needs. Visitors to the combined Vivitek - Delta booth can also view and experience the performance of Delta’s video wall cubes in UHD 4K resolution and laser-phosphor technology designed for demanding control rooms. Delta’s long experience in video wall technologies, ensure reliability and durability in many 24/7 applications, and can be depended on to bring control to even the most challenging of events or environments. At ISE 2018, Vivitek will show off its new and brightest single-chip DLP laser projector: the DU9800Z. The solid state illumination source projector offers 18,000 ANSI Lumens with a native WUXGA 1920 x 1200 resolution that delivers an impeccable standard of colour and detail. With 20,000 hours of laser light operation, this projector far exceeds the average lamp based projector and provides great value for money. Traditionally, 3-chip DLP projectors are used to reach such a high level of brightness, but Vivitek’s flagship projector delivers an impressive 18,000 ANSI lumen resolution with 1-chip DLP technology, using laser-phosphor illumination to provide colour accuracy and durability. Vivitek will also showcase its popular collaboration solution with the flagship product of the NovoEnterprise with the LauncherPlus. NovoEnterprise offers wireless, cable-free and hassle-free presenting to improve meeting efficiency and productivity by enabling increased collaboration. Combined, NovoEnterprise and LauncherPlus are ideal for meeting rooms where lots of external guests are expected as the LauncherPlus enables the guests to access wirelessly directly without having to access the company network. Also being shown, is Vivitek’s NovoDS4K UltraHD Digital Signage Solution which makes it easy to create vivid, instantaneous signage content. The NovoDS4K helps users easily create and display 4K digital signage content through easy-to-use software features, with no need for programming skills or special training. Commenting on its presence at ISE 2018, Holger Graeff, General Manager, Vivitek EMEA, said: “Achieve More Together encapsulates our proposition from both a customer perspective and the united front that Vivitek shares with Delta Electronics. To that end, visitors to the Vivitek stand at ISE 2018 will see our largest-ever array of solutions for meeting or collaboration rooms, large venues, control rooms or leisure and entertainment environments. Whatever the application or environment, customers can be assured that our solutions offer class-leading performance, reliability and value for money, enabling users to achieve more together with Vivitek and Delta.